Due to the Texas Legislature passing the Open Carry law in 2015, the word "concealed" no longer appears in state law in regard to handguns. "Concealed Handgun License" has changed to "License to Carry", and CHL has become LTC. 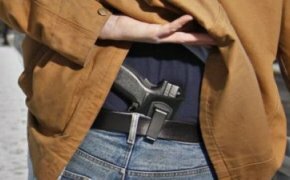 Anyone holding a valid CHL is automatically entitled to carry a handgun openly, in plain view, provided the handgun is in either a belt holster or shoulder holster. There are no retention requirements for that holster, and no other type of holster is allowed, so an ankle holster with shorts will get you arrested. Carrying openly will not constitute "intentional display", but you should expect that drawing the gun from the holster at any time and for any reason (other than justifiable deadly force) will likely get you arrested. Police officers may ask for your license without cause, at any time, simply because they see you carrying openly. Don't argue with them about it; they're just doing their jobs, and they won't know you're a good guy until they see your license. If you don't have that license, you will be arrested.